BM3 and Rozeta : is the problem still on ? Probably the quickest answer of the forum to a question : is Rozeta still problematic in BM3 ? Because yesterday, after struggling for 20 minutes with Rozeta Rhythm inside BM3, I was about to loose it when I remembered this old issue, so old that it slept my mind, or maybe, unconsciously I thought the problem was solved. So.... long question for short answer, thank you ! From what I heard it goes down to the core of how timing works in BM3, so it's not as quick a fix as some might think. There is no next version until there is a next version. It is not fixed until the code is shipped. No shipment of code means nothing in the version of code sitting in source control with that fix does anyone any good. If the code is there to fix the issue, then why not ship it? The point of deploying releases quickly instead of huge gaps in between is that it limits the effects of many small changes that pile up onto an already complex system. By limiting the possible cascading effects of shed loads of changes by shipping code quickly, you actually create a more stable application. Agile 101. This is not just unfortunate, it really just boggles the mind as to what’s going on with this product. 9 months no update? That is pretty much the definition of abandonment. Again...and again...If this bug has been confirmed to be fixed by Bram Bos in a BM3 beta, why not ship the code? You are unlikely to get an answer from a forum user, try emailing Intua direct maybe ? I'll just start a thread instead. Intua are forum members, so if they don't respond on their own forum, then they surely won't respond via email. I think the suggestion was that if you want to give practical advice to the devs about agile, it might be more direct and courteous to do so by email. Can all of us (myself included) try to put the knives away, please. We all want the same thing here, surely? The absence of updates and news has brewed rumors, concerns and in some rare cases completely unwarranted anger. Let's all try to remember what a fantastic piece of software we already have at our fingertips. The absence of updates and news has brewed rumors, concerns and in some rare cases completely unwarranted anger. There are no knives here. Questioning a companies direction on their forum is legit usage of it. Soliciting a response from a company regarding their development practice isn't knives... Its normal. The reason i suggested email is because it is a direct line to Intua, it has always been pretty clear that this forum is by users for users, as such we have pretty much been left to our own devices. That has been great for us as a community, try posting a user bank to the NI forum for Maschine, see how long your account lasts haha. So not to deter from making a new thread, by all means go ahead, like you say, this is an official forum, but it is unlikely to cover any new ground the myriad of mudslinging histrionics over at the AB forum achieved. I have yet to throw mud. I've never once insulted intua or anybody else. Asking for information and trying to understand is simply that. And yes, It is a great community for users! There are some spectacular users and contributors on these forums! That said, its a broken record to constantly hear the same thing from the same users... still broken or yeah, those don't work yet etc. The forum is riddled with the same type of responses to quite a bit of questions. How is that good for the community or users seeking help and seeing these responses? IMO...its not other than saying yeah, it doesn't work. The community has had to sit and console each other on bugs that should have been cleaned up for months. Now, it seems when somebody says hey, this is kinda nuts that we are sitting here with the same apparently known issues for so long...what gives? its considered toxic. I’m still waiting for Korg to fix their midi implementation in the iMS-20 from 2011. NS2 is 6 years behind schedule (😮). So I’m prepared to be patient with Intua. @mathieugarcia said he’s working on a big update and that it’s going to take a long time. That could be a full year in the developer hourglass. Who knows? @drez who said it was toxic ? If you think that the same users answering "No its still broken" is bad for the community vs some kind of lie, im at a loss, that quite simply is complete nonsense. A question is asked, and honest reply is given, no matter who gives the reply, that is good for the community, end of story. Just curious, does Apple Garageband for iOS support AU MIDI yet? If not, I'd be curious as to what Apple changes/removes in the next update. The iOS music platform has become complex in a few short years, and all the great innovations have essentially been 'hacks' or 'loopholes' in little-used or undocumented things. (The SysEx 'pipe' for Audiobus (Apple closed that and released IAA, then AUv3), the discovery of MIDI OUT in AUv3 by Bram Bos...what's Apple gonna do? 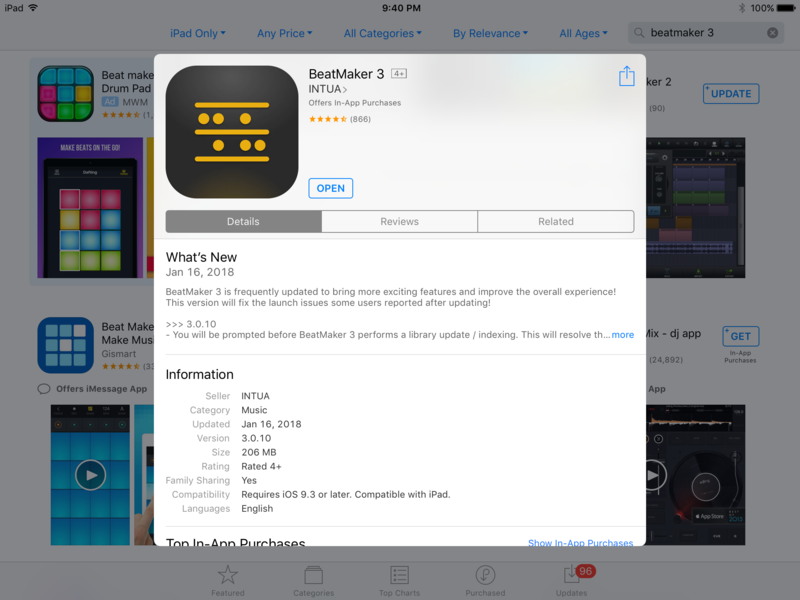 Wasn't bm3 just updated in September? Maybe I'm in error?